French married couple, which I met a few days ago, and I slept just near the border town last night that it didn’t take long time to get to the border. Just in front of the border, I saw guys having money on their hands for exchanging on the street. I asked them the rate, but I was not sure that it was fair. So, I didn’t exchange money. We had to wait for a while at Iranian immigration office, but once immigration officer arrived, it didn’t take much time. 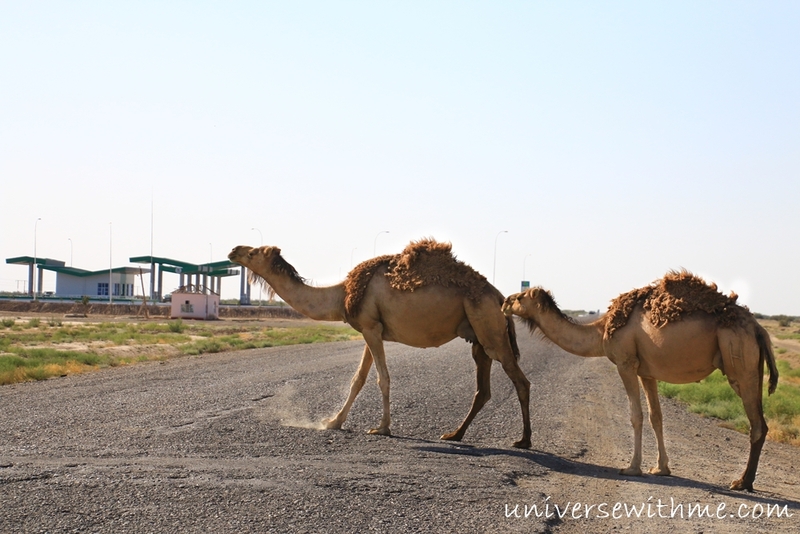 Once I got to Turkmenistan immigration, I had the problem. They told me I had to pay $14 for the entrance tax and they only accepted USD. I asked to pay in Euro, but they said WE ONLY ACCEPT USD! Fortunately, French couple exchanged my money and I could pay in USD. We had to take all our bags to x-ray. Then they asked us to open and take all out to see. It was first time that immigration must check every single thing. It was good that I sold my drone before coming here. If they saw my drone, maybe I would be in trouble. They checked French couple’s bag first and French couple had to explain what things were. When it was my turn, they were a bit easy-going that they checked my belongs less than French couple’s bags. We stayed at the border more than three hours. 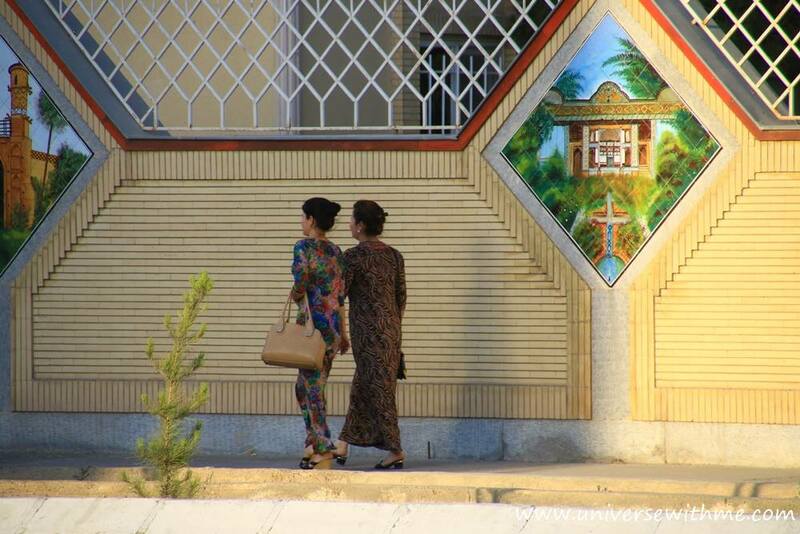 One thing I was really happy after entering Turkmenistan was that I didn’t need to wear hijab anymore. But the happiness didn’t go long because I had the pain to cycle on the broken asphalt like the picture. The road condition was really bad. Although it was flat, I could not cycle faster because to cycle on broken road was really tough. Even there was strong head wind. 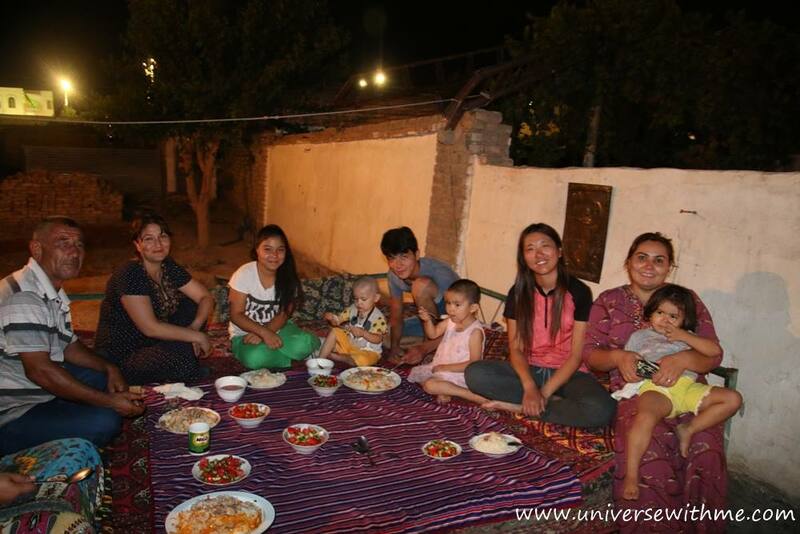 The government of Turkmenistan controlled very strictly that most of traveler could get only five days transit visa. 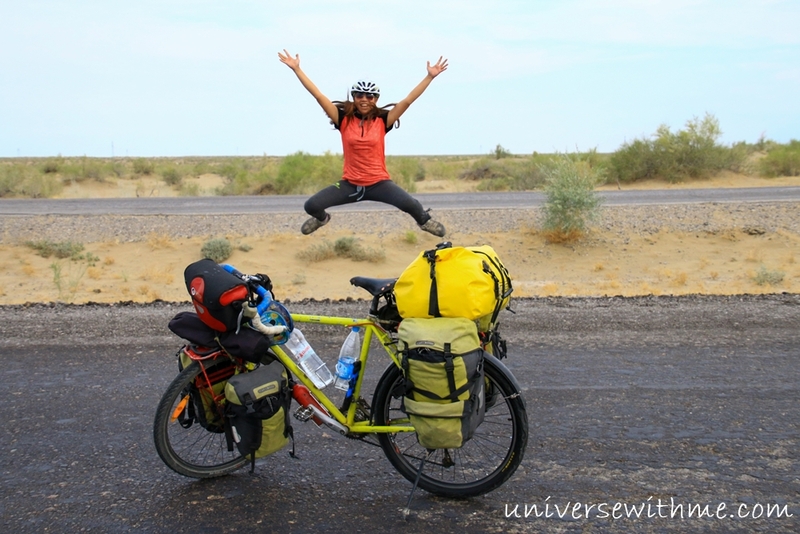 It meant that I must cycle 500km (310mi) in five days to the next border. I entered into this new country on 1st and I must get out on 5th. I was not sure what time border would close. So I was thinking I should be in the border before 4 pm on 5th. Usually the wind blew in one direction here. 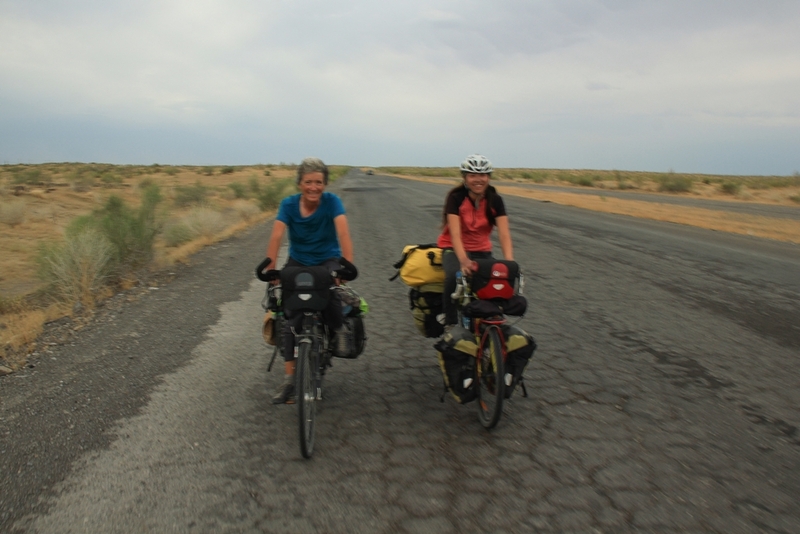 When people cycled from Uzbekistan border to Iran border in Turkmenistan, they would have tail wind. I was going opposite way that I would have head wind. After the border, I could exchange some money. Around midday, it became very hot. We stopped at some restaurant. French couple had some drink. I was hungry that I ordered some food. 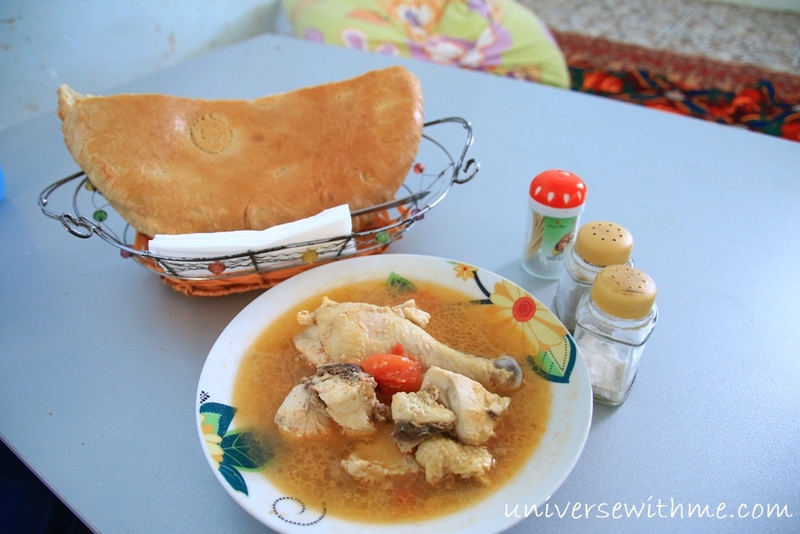 It was my first Turkmenistan food. French coupled left after drink with saying see you. I had my meal and some rest after they left. It was something like Iran that I had to take off my shoes and sit on the floor. One different thing was that I ate on the table. After meal I could lie down and had short nap. I saw some people’s picture of Central Asia on online. About two years ago, I started dreaming going to Central Asia and finally I was entering here. The adventure was some weird thing. It drove my life so hard and there were too many difficulties I had to go through while having adventure. But when I had challenging on the adventure, it made me think about what important thing is in the life and who I am. At the end of adventure, I would feel amazing achievement. Usually it would give me motivation to live. 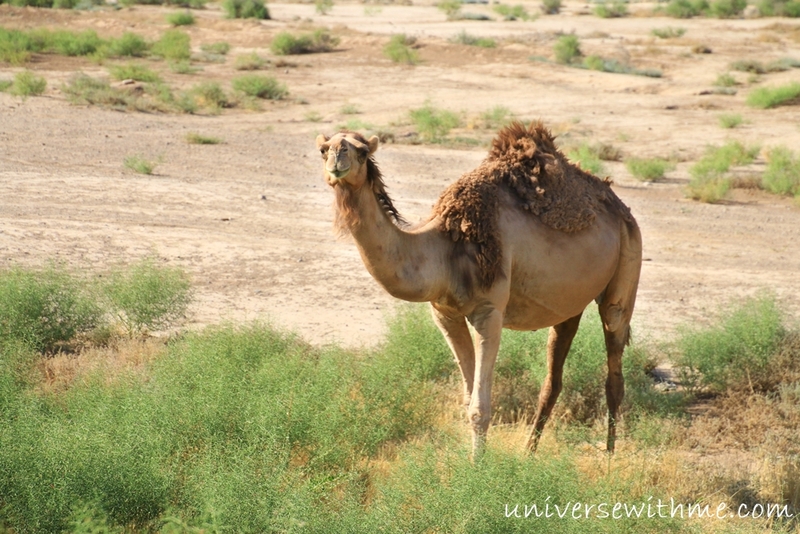 It was desert area that I could see camels time to time. The temperature went to up 45c (113f) later. When the night arrived, I could feel still warm air. Worrying about where to sleep tonight, I saw French couple near a village. They were about to cook after buying some cheese and yogurt from a small supermarket. They asked me to join the dinner together and to look the place for the tent. Today I had cycled only 82 km (50 miles). I had to cycle 420 km (260 miles) in four days. It was not easy to find the place to pitch the tent because it was farm with water area and too dark to see a good ground. We saw some light on a small road and heard people’s talking. 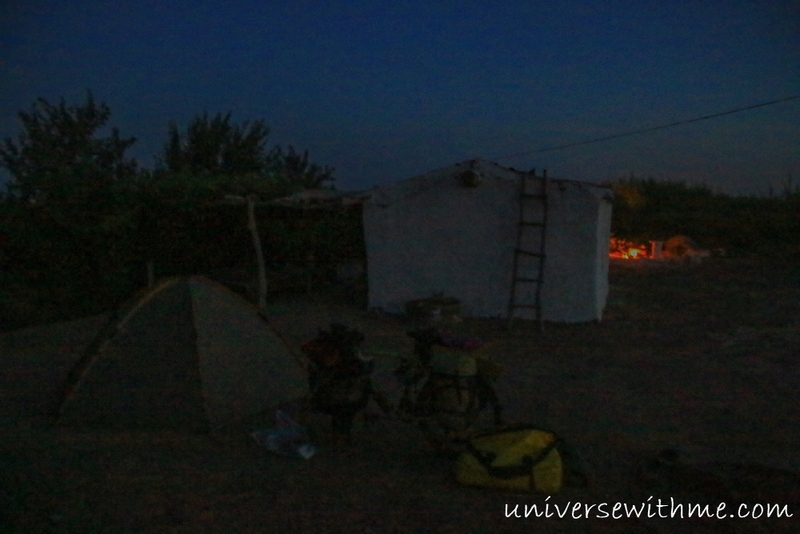 We went there and asked local people to set up our tent around their house. After one hour, they said they had different house that they would go home to sleep. After they were gone, we took the shower at different places. My ears became so sensitive that I was scared at small noise. I thought to take the shower inside of my tent was better. 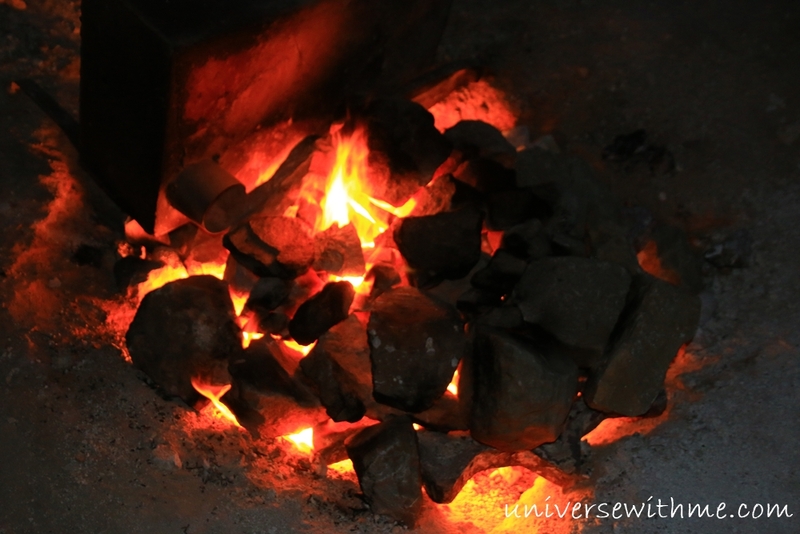 There was one interesting that the fire under the rock was never stopped. 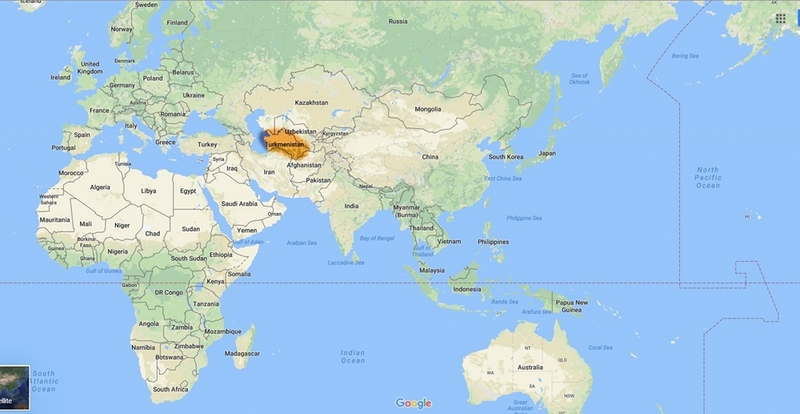 I was curious that maybe there was gas because Turkmenistan was the country having much nature gas and even the government gave people gas for free. The sun was too hot that it heated the ground and it was still very warm in the night. I felt like I was sleeping at Sauna that I sweated endlessly. It was impossible to sleep well. At the next morning, French couple left first and I started soon too. I saw young people having chat while passing a small city. Some of local people had similar face as me. I wanted to have the time to talk to them that I stopped my bicycle. But it was difficult to communicate because of language barrier. One of them let me take the picture together with my bicycle kindly. They had some unique clothes and city atmosphere. Actually it was similar to North Korea which I saw on the media. Today I cycled from very early morning like 5 am. I felt that before the dark I could arrive in Mary which was a bit big city. I saw on offline map that there was a world biggest yurt just at the next to the road. I tried to see what’s there but it was closed. 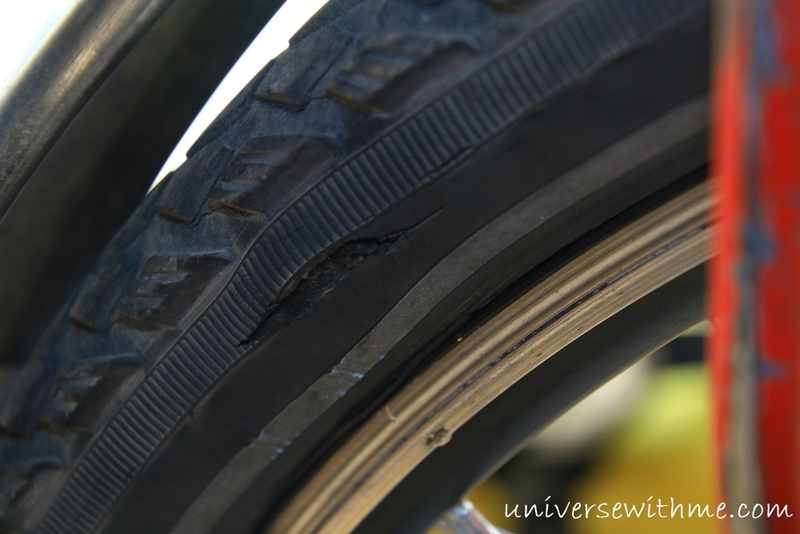 I had two times flat tire in last week and I had one more flat tire in Turkmenistan because the side had crack. 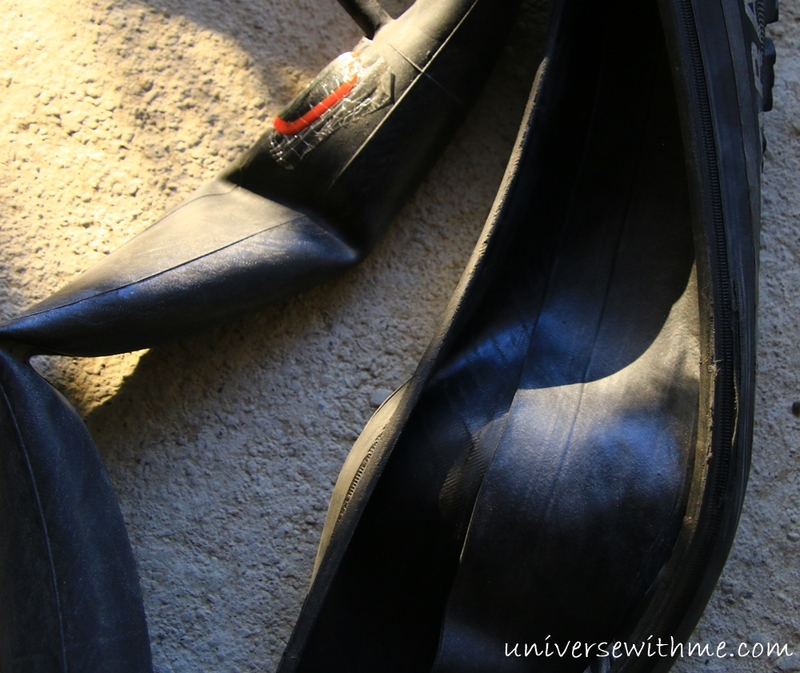 One time I used my old Schwalbe tire until it showed blue on the surface because worn out was not a big problem. But to have crack on the sidewall was different that it was serious thing since it made hole on the tube. I doubted that too hot temperature broke tire. I carried extra broken tube in case. I cut and put it on the broken side when I fixed my flat tire in Turkmenistan. I was not sure how long it would last. Before entering to the city, Mary, I saw a bicycle shop. 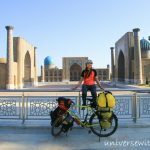 I thought it would be the best bicycle shop I could find in Turkmenistan on my way. I would order a new tire once I got the internet and would send it to some city I would reach after a month. I just bought $3 tire for emergency. The guy from bicycle shop changed my tire. As I cycled very hard today 130 km (80 miles), I reached to a big city with a daylight. The city was quite well organized and cleaned with huge buildings. It had the similar atmosphere with the picture of North Korea. I found some hotel and saw the price $15. When I was about to pay, a receptionist told me $15 was for local people and foreigners must pay $35 in only USD. They said they only accept USD. I felt like Turkmenistan treated foreigners as ATM for USD. I was wondering why hotels and government always asked USD. Some of travelers told me it would be for raising a slush fund. Also local people would feel that local currency was not stable so that they wanted to have safe money. Some people told actually these kind of countries might collect Cryptocurrency like Bitcoin lot these days. Hotels looked so luxury and nice in Mary. The price was only around $45 to $50 that I thought it was reasonable price. But for me it was too expensive to afford. I asked local people where cheap hotel was. Finally, I found something before the dark. It was very old grey hotel that I would not be surprised to see a ghost on this hotel even. It was around $12 and they accepted local money. Toilet was outside. But there was one fantastic thing that I had air conditioner. Eventually, I could sleep well. I used my tent as a bed sheet and sleeping bag as a blanket because I was afraid of having bed bug. Passing a small town, I was asking people where I could exchange money. A taxi driver told me he could exchange my Euro to local money. I told him little bit high rate, but he accepted it. I was really happy that finally someone accepted Euro as money. At the afternoon, the temperature went to up to 48c (118f). But it was really lucky that every small shop and restaurant had air conditioner that I could cool down. Usually at the lunch time, I could have the rest and short nap at the restaurant. Hardest part was to go out from lovely amazing cool heaven to hell hot desert. Actually there was one thing I could not understand. 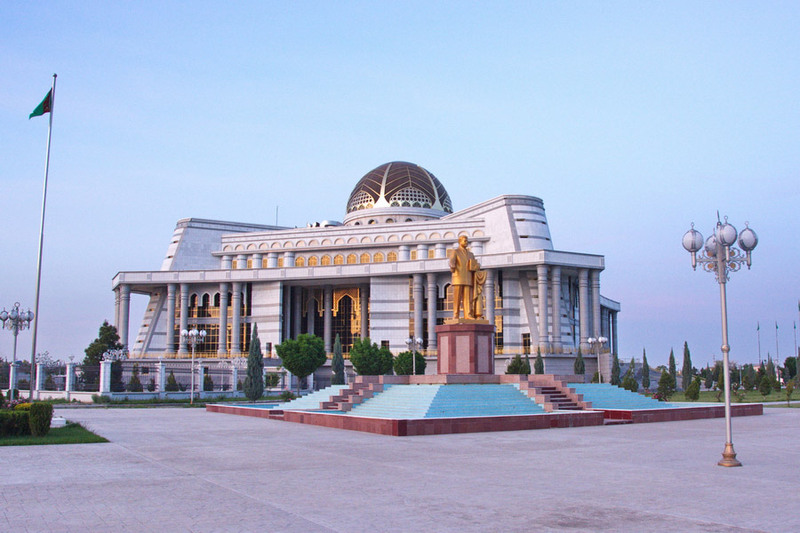 I felt Turkmenistan was a bit developed because every place must have A.C and the building was not bad. But the toilet was squat hole at the outside like Africa. It was worse than any other countries because many times it was full. The most challenging toilet was Turkmenistan one in my memory. One time I was in a clean nice restaurant in the city. I asked the toilet and the guy told me I had to go out. It was just at the middle of the road. Once I opened the door, it was the worst hell toilet in my life that it was TOO FULL!!! Guess what? I used there because it was too busy street to go and hide for pee and I could not wait to find other toilet. So, usually before entering into the city or restaurant, I used the toilet on the nature. To find a restaurant was such a lovely thing because I could cool down with A.C. However, many times there was nothing between 20 to 40 km (24 miles). So, to have watermelon on the road was one of nicest things. Usually the road was very bumpy with broken asphalt. One time I had to cycle on very bad condition road. The temperature, 45c (113f), was just crazy hot and I had to cycle with the head wind. I saw some gas station with a hotel on offline map, Maps.me on my phone. I decided to cycle until that place which would be total 120 km (74 miles) distance today. I needed to cycle only 180 km (111 mi) in two days then. The night was coming, but I had to cycle 25 km (15 mi) more to the gas station. The head wind was blowing stronger and it was not possible to hide for wild camping. Suddenly there was strong sandstorm that I could not see the front. It was not possible to cycle that I had to push my bicycle. I was not sure how I could keep going that I had to close my eyes to hold my tear coming out for the moment. When I was exhausted, scared, and annoyed, then tear usually came out with frustration. But this time I didn’t have time to waste with crying. I tried pushing my bicycle and then pedaling again. After 30 minutes, finally the sandstorm was gone and I could see only light of my lantern of my bicycle and stars of the sky. Usually to me the scariest time on the road was just before the sunset. Once it got totally dark, I calmed down. 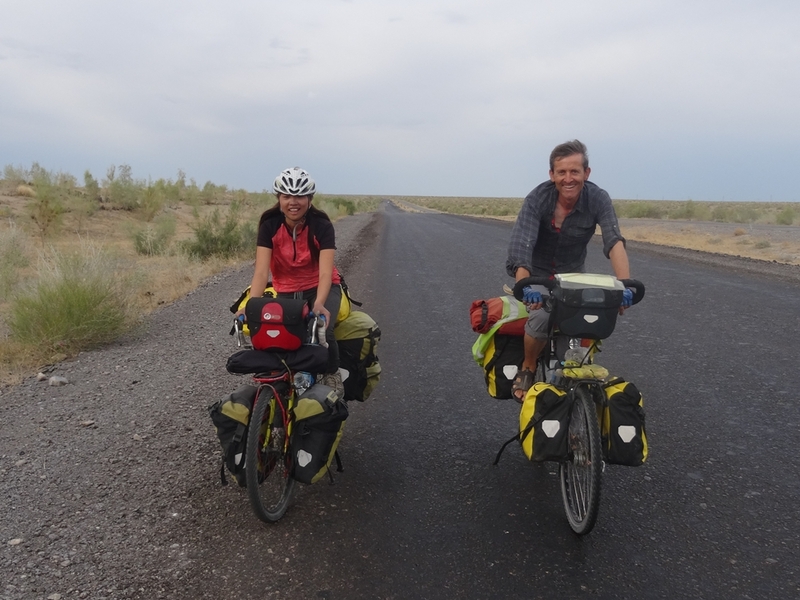 I started cycling from 5 am and I could get off from my bicycle seat at 8 pm after cycling 120 km (74 mile). I saw French couple’s bicycle in front of the hotel building. The hotel looked nice but they asked USD again. I begged that I wanted to pay in Euro or local money but they said they would only take USD. I doubted that why they didn’t change their official currency to USD. I just went out and asked the restaurant to set up my tent. 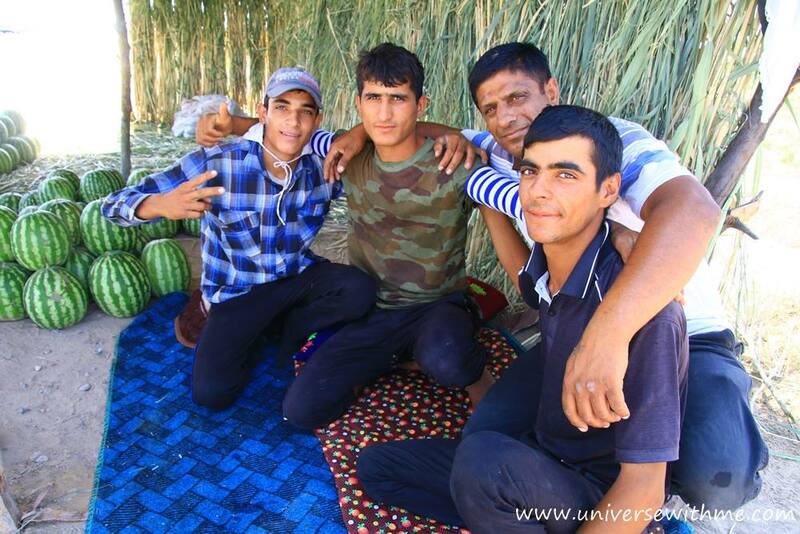 The worker told me I could sleep at yurt which had air conditioner for $10 in local money. I could take the shower at the bathroom at another building of the hotel. At the next morning, I met French couple again. They told me they saw sandstorm when they had dinner at the restaurant in front of the hotel. I was at the road at that time that I felt my life looked too weak. 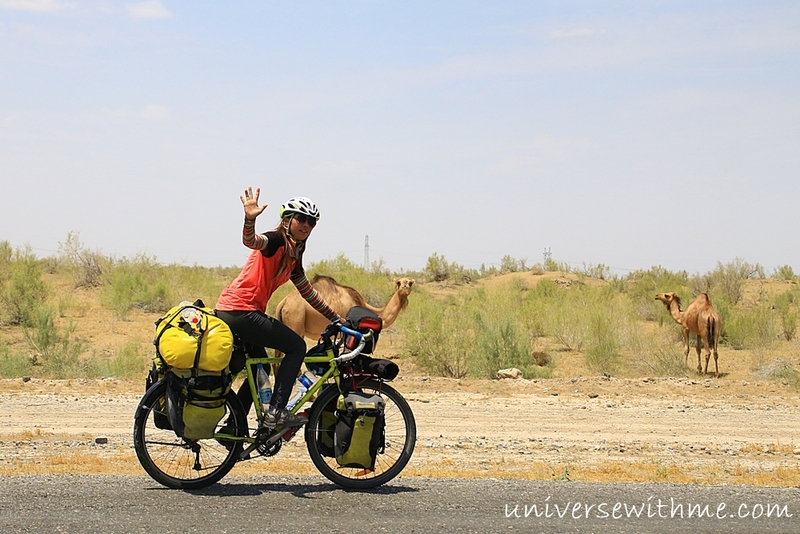 Frankly speaking, when I saw other western cyclists, I felt frustrated because when I had to cycle for 15 hours to make 120 km like yesterday’s condition, they usually spent time for 10 to 12 hours. At the end of day, I felt too exhausted to enjoy hanging out with local people or going out. Even I could not sleep well if I had hard day like yesterday. It was really unfair game but on the other hand actually very fair game too. I had to spend too much energy and time to hang out later in the night after hard cycling day, but what fair thing was I could reach to the same place where other people would go at the end. I was cycling with French couple in the morning a bit together. Later they went with their speed and I went with my pace. At late afternoon, a guy came out from the car and talked to me. He told me he would look for the place for me at the next city where I was heading. He gave me his phone number. Today the headwind was not that strong and the road condition was better. Therefore, I arrived to the city after cycling 135 km (83 mi). It meant now I had only 40 km (24 mi) left to the border. I called the guy whom I met at the afternoon with helping of local people’s phone. 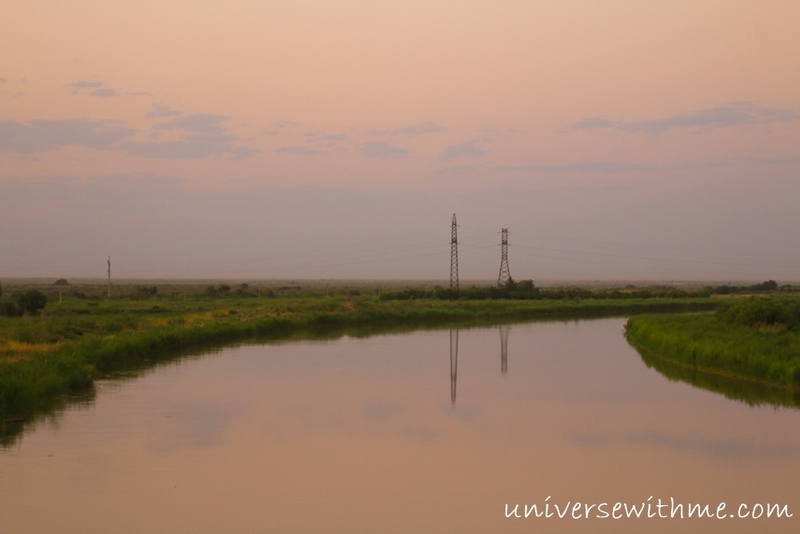 I didn’t have sim card and wifi while staying in Turkmenistan. After waiting for an hour, he showed up with very expensive car and his driver. He said he would find the hotel for me. I told him I didn’t have much money to sleep at expensive hotel. He said he would look for it that he suggested to put my bicycle and luggage at his car. He went to some hotel and told me if I paid $50, I could stay there. I was not sure why he brought me at this expensive hotel because I already told him that my budget was too low. Maybe $50 was nothing to him and he thought I could not find the hotel which was on the map of my phone. I told him thank you for helping me but I would find the place to sleep by myself. It was already 9 pm. I was very tired to find a place to sleep at the city in the dark. It was said there would be some festival and the president would visit. So, many people were working to clean and decorate the road until late night. The guy trying to help me to find the hotel told usually bars or clubs must shut down before 11 pm or 12 pm because everything must be under control. So it was interesting to see people working until late night for welcoming the president. I was checking small roads to see the people to ask. I saw one guy talking to other people in front of house that I asked him to set up my tent at his family house. He was asking his wife and let me sleep at his property. The house was connected to other house. It seemed these two houses were for same family. Many children and their neighbor visited me to say Hello that I became a big star to them. They invited me into their dinner too. I was so happy that I could have some memory with local people at the last day. 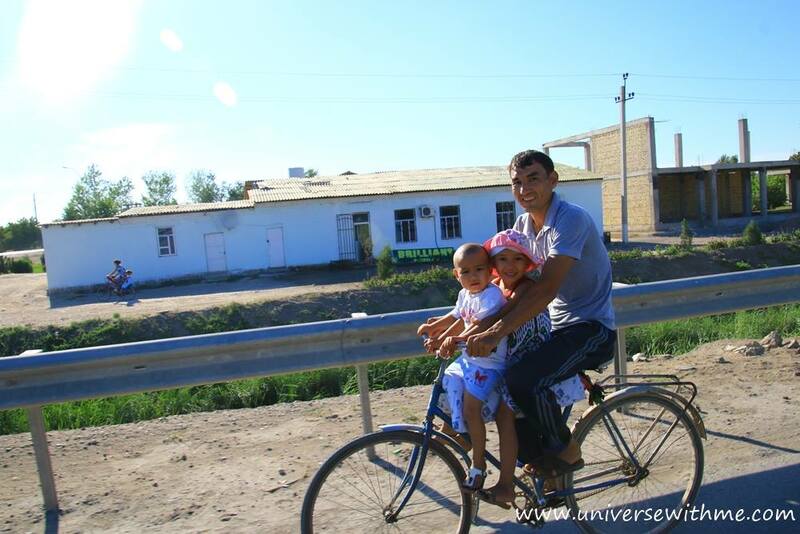 Next morning, I could see many people taking their children to school on a bicycle. The school building and playground looked good that I took the picture. I cycled everyday almost 130 km (80 mi) for three days. So the last day was easy. I arrived at the border around 11:50 am, but the immigration soldier told me come back after lunch time. I went to the restaurant but there was no A.C. The time really didn’t go fast that I was already exhausted with the heat. After lunch, I just went to under the tree to kill the time. On the way back to the border, the car stopped and woman driver asked me to exchange money. I asked the price and realized there was the black market for Turkmenistan money. I did know there must be black market in the next country, Uzbekistan. 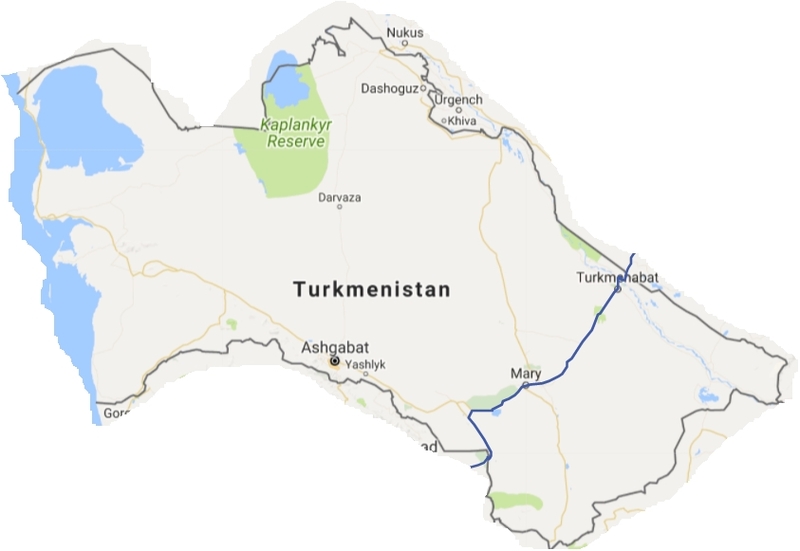 But I really didn’t know Turkmenistan would be similar. That’s was reason taxi driver didn’t hesitate exchanging my Euro when I told a bit high rate. I was not sure that her exchange rate was fair. So I only changed some small left Turkmenistan money to Uzbekistan money. Although lunch time finished, the border didn’t open yet. They told me I should wait more. When I was under the tree, I saw French couple arrived. They told me they stayed at the same city as me last night. It was good to see them almost every day. Once I arrived at the immigration, they didn’t check my luggage much. My effort about hiding photo came to nothing. I heard I must register the address every three days in Uzbekistan and the exchange rate on black market was so higher than official bank rate. It seemed so complicating and difficult place to cycle. 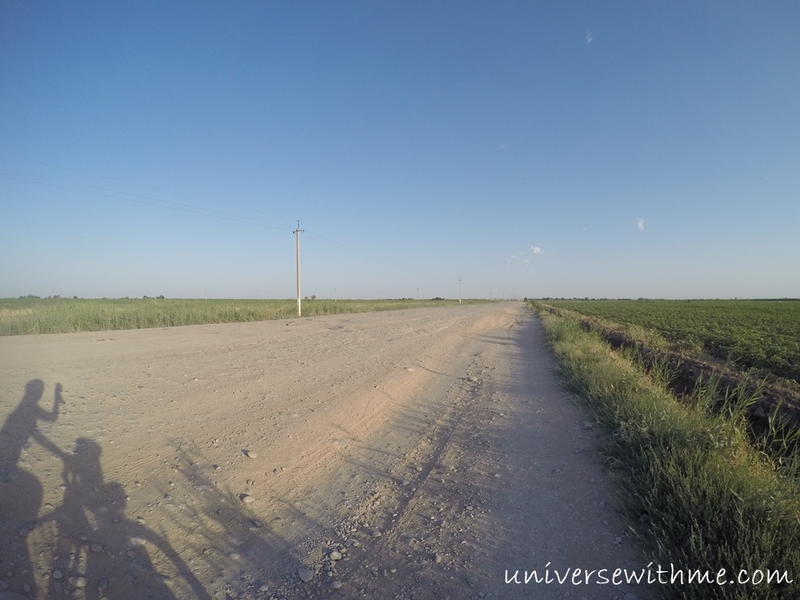 Once I arrived there, I would figure out that I just pedaled to Uzbekistan border. Really enjoying your blog. Thank you. Very interesting journey, an invaluable experience. Have fun and take care. 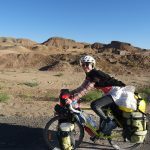 Following your blog since you were in south amercia, very intresting stories. Stay safe and if you happen to be in Pakistan; i would love to be your guest. Thank God you have now started regularly updating your blog. 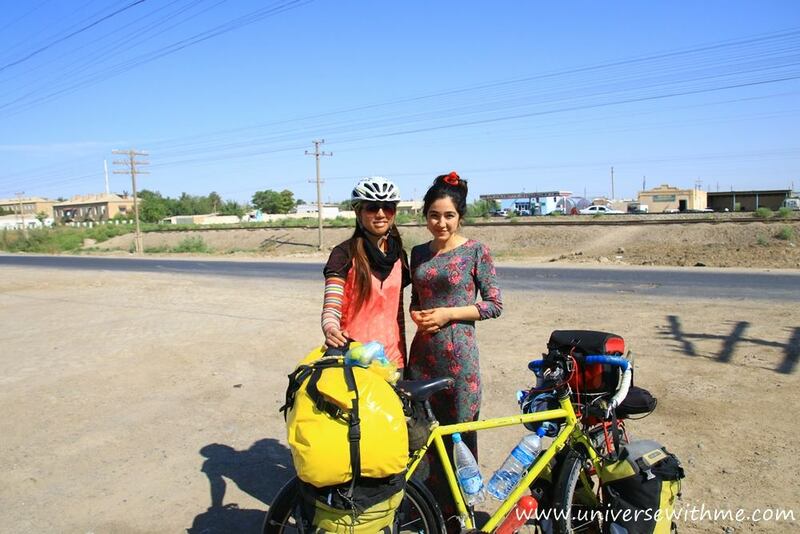 So now you have moved towards next destination but I feel a lot of thirst about Turkmenistan because there were a lot of places you should have explored here and we would have been enlightened through your cycle journey like you have done in your previous journeys. As such I feel starved of the amusement that should have been gained to see the Turkaman culture. So please display more info and more pics in your next journeys. Keep on following the footprints of Marcoplo and Ibne Batoota. Stay blessed. You could also transfer dirs and files to your webserver (where your website is hosted) by FTP if you have spare rome there (and wifi). It is then save to delete them in your laptop since webservers are the most secure computers when it comes to storage and backups. Later on just download them, and/or ask someone trusted to (also) do so. I have 100GB hosting for some Euro 70 per year at a european (save) datacenter. That is far better in many aspects then any free or payed (non-personal) cloud. Last but not least you could use a large (little) micro-sd-card for storage and put it somewhere in your luggage (wallet ?!). Or just put it in your camera after having hided the directory you want to hide in Explorer, as described above. And then just have some regular pictures on the card that you need not hide.